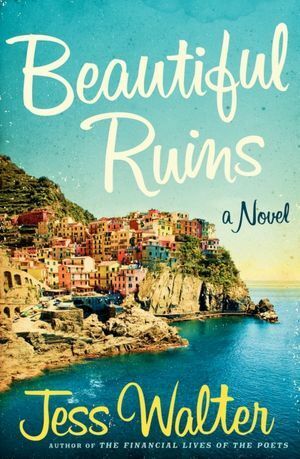 This is one of those books that has been near the top of my TBR list for over a year, but it kept getting pushed aside for other books. Then, I received a copy through one of my postal book clubs and had to read it...and I'm so thankful that I did. I have to admit that I was familiar with Jess Walter as a person, but not as an author before reading this. I listen to the podcast he does with Sherman Alexie and the two make a great pair. However, I couldn't quite picture the person from the podcast writing a story as chronicled in the summary. Luckily, it turns out that the man and the story merge perfectly. 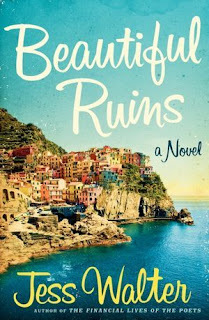 Reading this book felt like an extravagant vacation--the reader goes to Rome, to a small village on the Italian coastline, to Hollywood, to Idaho, to London and Edinburgh, and to Beaverton (although that last one probably doesn't fall into the "vacation" category!). Obviously, this book is all over the place--not just geographically, but also chronologically. I was worried about that, but it did work for me in this case. I was able to follow all the story lines without any problem. The characters are what really make this book work. I won't go into the specifics about each one (like story lines, characters abound here), but I will say that I found myself relating to all of them, including the one really unlikable (yet entertaining) character. Because there are so many people and story lines, Walter explores facets of the characters instead of developing the entire character. In another book, I would find this annoying. However, there is more than enough here so that Walter's approach is successful. All in all, this was a lovely and satisfying book, with something for every reader. I would recommend it to anyone without hesitation.